Corporate Sales Representative is involved basically in developing, building and managing the client base of corporate accounts. The job duties for these reps are extended to overseeing the sales processes from scratch till end, targeting new and existing accounts, collaborate with marketing department to execute corporate sales ideas, prospect new customers via emails, sales calls, networking events, follow lead generation and promotional events, analyze sales trend and generate monthly sales forecast and participate in conferences, community events and trade shows to promote corporate programs, and troubleshoot customer service issues. 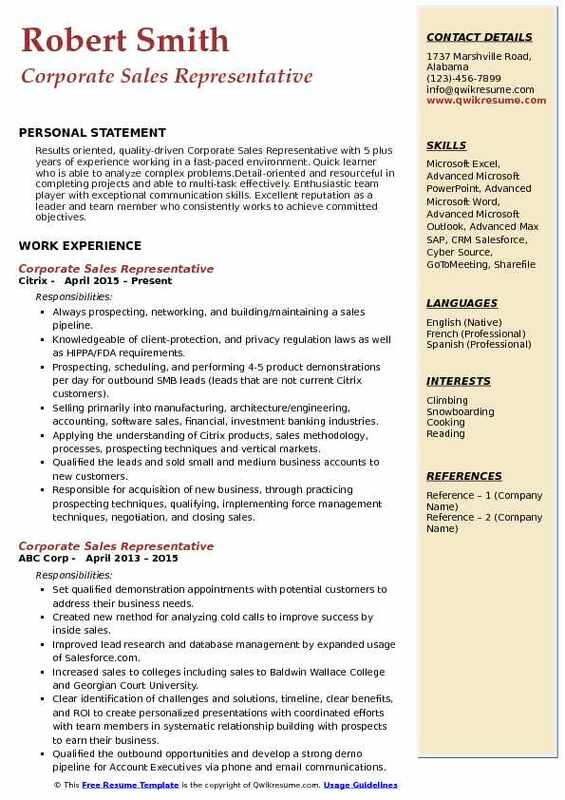 Some of the best resumes portray job skills such as meeting sales goals, territory management, product knowledge, proficiency in MS Office and knowledge of CRM & documentation software. 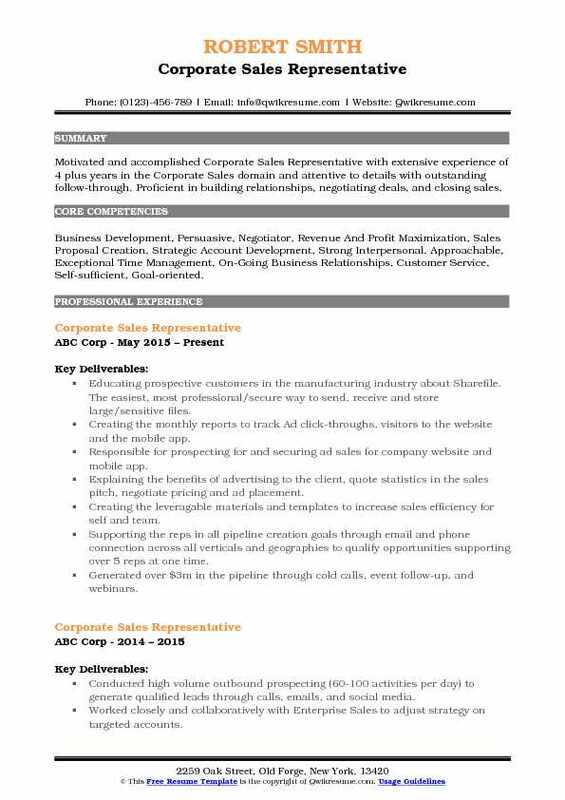 Degree in any field is considered mandatory for this post; however, a Bachelor’s Degree in Commerce is normally seen on the Corporate Sales Representative Resume. Summary : Corporate Sales Representative IV with 28 plus years of experience is seeking to obtain a position that will enable me to use my strong interaction skills, sales background and abilities to conduct excellent customer service. Reviewing the recordings of orders placed between an agent and a customer, completing a resolved outcome and placing outbound calls to customers with recording results. Receiving some inbound calls placing sales orders. Making the prospecting calls to better understand business structures and introduce the products. Performing meetings with clients worldwide and strategizing workflows for their electronic signature needs. Having composed emails to send to prospective, current, and new clients which were adopted. Studying and training the colleagues on federal and state laws regarding ethical compliance and data. Delegating for trade shows and seminars dealing with professionals in the legal sector. Consistent sales quota attainment on an aggressive month-to-month goal cycle for 3+ years. Prospecting to corporate clients via phone and email, demonstrated multiple platforms via the web. Summary : Senior Corporate Sales Representative with 7 plus years of experience in the Healthcare domain is seeking a sales position in which I can make a significant contribution to an employer through an increase in sales, volume, and profit. 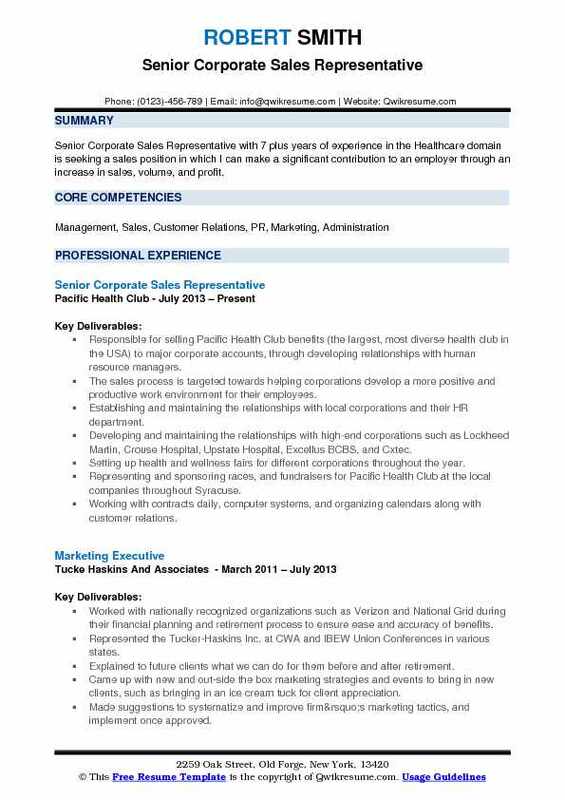 Responsible for selling Pacific Health Club benefits (the largest, most diverse health club in the USA) to major corporate accounts, through developing relationships with human resource managers. The sales process is targeted towards helping corporations develop a more positive and productive work environment for their employees. Establishing and maintaining the relationships with local corporations and their HR department. Developing and maintaining the relationships with high-end corporations such as Lockheed Martin, Crouse Hospital, Upstate Hospital, Excellus BCBS, and Cxtec. Setting up health and wellness fairs for different corporations throughout the year. Representing and sponsoring races, and fundraisers for Pacific Health Club at the local companies throughout Syracuse. Working with contracts daily, computer systems, and organizing calendars along with customer relations. 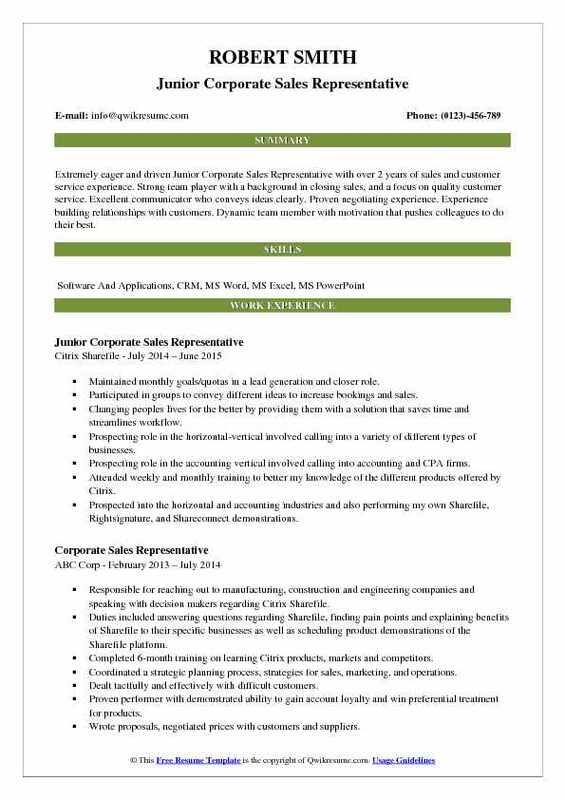 Objective : Extremely eager and driven Junior Corporate Sales Representative with over 2 years of sales and customer service experience. 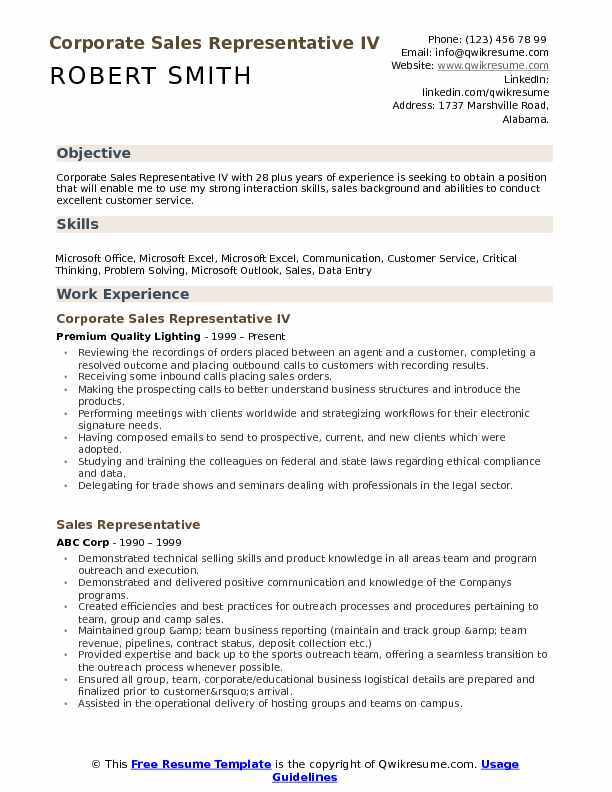 Strong team player with a background in closing sales, and a focus on quality customer service. Excellent communicator who conveys ideas clearly. Proven negotiating experience. Experience building relationships with customers. Dynamic team member with motivation that pushes colleagues to do their best. Maintained monthly goals/quotas in a lead generation and closer role. Participated in groups to convey different ideas to increase bookings and sales. Changing peoples lives for the better by providing them with a solution that saves time and streamlines workflow. Prospecting role in the horizontal-vertical involved calling into a variety of different types of businesses. Prospecting role in the accounting vertical involved calling into accounting and CPA firms. Attended weekly and monthly training to better my knowledge of the different products offered by Citrix. Prospected into the horizontal and accounting industries and also performing my own Sharefile, Rightsignature, and Shareconnect demonstrations. Investigated the potential prospects workflow to gauge relevancy and come up with the proper solution to best fit the customer's needs. Attended weekly pipeline meetings with manager to discuss metrics and performance. Objective : Skilled Jr. Corporate Sales Representative with 2 plus years of experience committed to addressing client concerns with speed, accuracy, and professionalism. A resourceful Corporate Sales Representative who maintains a high level of professionalism, patience, and efficiency to minimize client dissatisfaction, to increase client loyalty to help drive sales in an environment that creates a world-class shopping experience for each and every client. Responsible for employing technology expertise and customer service skills to work directly with clients over the phone and/or chat. Also, utilizing the selling skills, technical expertise, and customer service skills to provide impartial, knowledgeable advice in recommending products and service solutions to ensure client end-to-end needs are met. Consistently exceeding quality standards, sales metrics, net promoter scores, while providing products and services of the highest caliber to each and every client. Responsible for working closely with services, support, logistics, and sales teams to promote the best. Resolution and customer service for our clients by providing them with world-class service. Demonstrating effective decision-making skills and the ability to reason and take action in resolving problems while exhibiting professional sound judgment. Continuously building product and process knowledge using internal training courses and the knowledge. Utilizing critical thinking and creative problem-solving skills to create the strong and lasting customer. Summary : Results-focused, quality-driven Corporate Sales Representative II with extensive experience of 16 years in sales, management, business administration, and marketing. Enthusiastic and thrives in a fast-paced environment that is focused on consulting and providing exceptional customer service. Generated leads and cultivate prospects by conducting communications through cold calling and analytics to close sales opportunities for Citrix Sharefile software product. Built prospect relationships to move opportunities and upselling potential through the sales funnel while tracking progress through the CRM software. Called leads to qualify and develop pipeline according to the Citrix Sharefile sales process. Called into a target accounts subsidiaries to build relationships with decision-makers to create opportunities. Used the Citrix sales methodology to progress opportunities through the pipeline and close Sharefile standalone business. Managed data for new and prospective clients in salesforce.com, Citrix Coffee System ensuring all communications are logged, information is accurate and documents are attached to ensure senior closers had the perspectives to increase sales. Interacted with the regional sales team to develop and grow the sales pipeline while identifying upselling potential to develop average deal size. Specifically worked in the Healthcare Vertical with Doctors, IT Managers, and Business Owners providing information about Sharefile right signature services to enhance their workflow. Work directly with the Citrix sales team to identify potential areas for new business development. 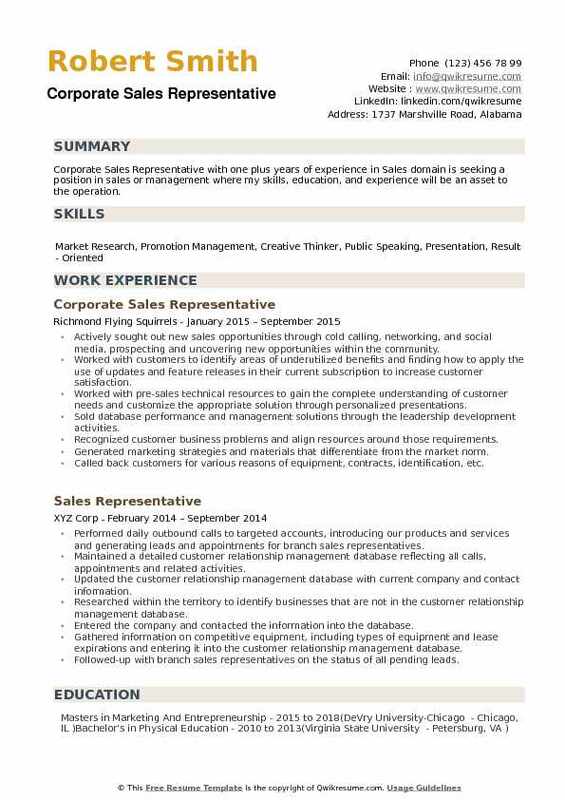 Headline : Corporate Sales Representative with 5 plus years of experience in Corporate Sales is seeking to secure a full-time position in your industry and demonstrate my organizational, customer service, and administrative skills. Demonstrating, and using the sales techniques to effectively garner new clients for myself and other sales associates. Conducting sales training for corporate sales associates to make them more effective prospectors. Prospecting the calls, networking with potential clients, and performed demonstrations of Sharefile. Building a sales pipeline, and evaluated specific needs of potential clients. Informing the clients of state and federal encryption, client protection, and governmental regulatory laws. Assisting the success of the largest sales team in the mobile apps sector of Citrix systems. Performing sales trainings for new hires to make them effective prospectors to provide closers, like myself, with quality leads to perform. Managing an organized and effective pipeline on a daily basis to hit monthly quotas. Prospecting, cold calling, lead calling consistently signing up and working with new accounts. Summary : Sr. Corporate Sales Representative with 10 plus years of experience is seeking a challenging and rewarding career in business, collaborating with a dynamic team to exceed the company's goals and customers expectations. Meeting and exceeding the assigned sales targets and quotas by prospecting, identifying, developing and closing sales opportunities following the Citrix sales cycle. Through collaboration with coworkers and management, evaluating the territory and creating the account. Negotiating and closing the standard sales engagements as well as complex multi-stakeholder deals. Participating as a team player across the sales, sales ops, finance, legal and customer care. Providing sales management with accurate forecasts and reports on sales activities in a timely. Utilizing the company CRM system to create and work sales opportunities and quotes. Maintaining the accurate and up-to-date quotations, account activities, opportunities, tasks, leads, etc. and various reports in accordance with Citrix policy and ethical business practices. 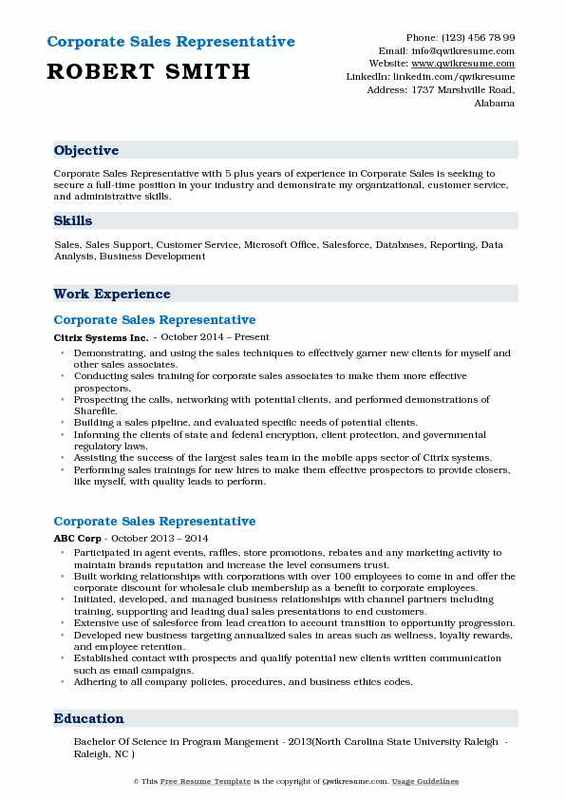 Objective : Motivated and accomplished Corporate Sales Representative with extensive experience of 4 plus years in the Corporate Sales domain and attentive to details with outstanding follow-through. Proficient in building relationships, negotiating deals, and closing sales. 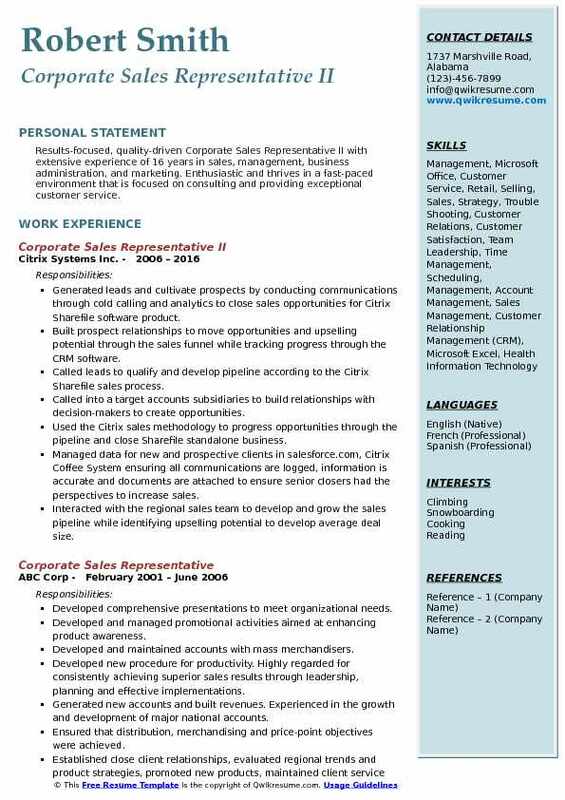 Skills : Business Development, Persuasive, Negotiator, Revenue And Profit Maximization, Sales Proposal Creation, Strategic Account Development, Strong Interpersonal, Approachable, Exceptional Time Management, On-Going Business Relationships, Customer Service, Self-sufficient, Goal-oriented. Educating prospective customers in the manufacturing industry about Sharefile. The easiest, most professional/secure way to send, receive and store large/sensitive files. Creating the monthly reports to track Ad click-throughs, visitors to the website and the mobile app. Responsible for prospecting for and securing ad sales for company website and mobile app. Explaining the benefits of advertising to the client, quote statistics in the sales pitch, negotiate pricing and ad placement. Creating the leveragable materials and templates to increase sales efficiency for self and team. Supporting the reps in all pipeline creation goals through email and phone connection across all verticals and geographies to qualify opportunities supporting over 5 reps at one time. Generated over $3m in the pipeline through cold calls, event follow-up, and webinars. 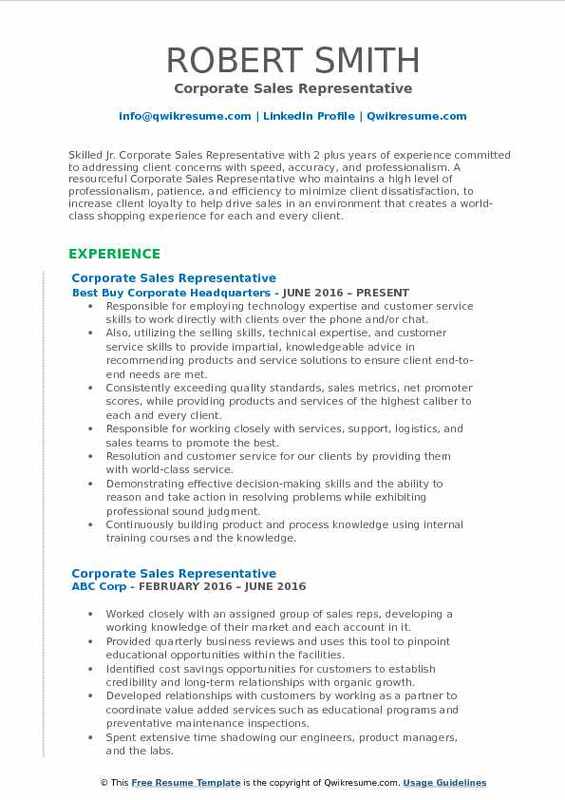 Headline : Results oriented, quality-driven Corporate Sales Representative with 5 plus years of experience working in a fast-paced environment. Quick learner who is able to analyze complex problems.Detail-oriented and resourceful in completing projects and able to multi-task effectively. Enthusiastic team player with exceptional communication skills. Excellent reputation as a leader and team member who consistently works to achieve committed objectives. Always prospecting, networking, and building/maintaining a sales pipeline. Knowledgeable of client-protection, and privacy regulation laws as well as HIPPA/FDA requirements. Prospecting, scheduling, and performing 4-5 product demonstrations per day for outbound SMB leads (leads that are not current Citrix customers). Selling primarily into manufacturing, architecture/engineering, accounting, software sales, financial, investment banking industries. Applying the understanding of Citrix products, sales methodology, processes, prospecting techniques and vertical markets. Qualified the leads and sold small and medium business accounts to new customers. Responsible for acquisition of new business, through practicing prospecting techniques, qualifying, implementing force management techniques, negotiation, and closing sales. 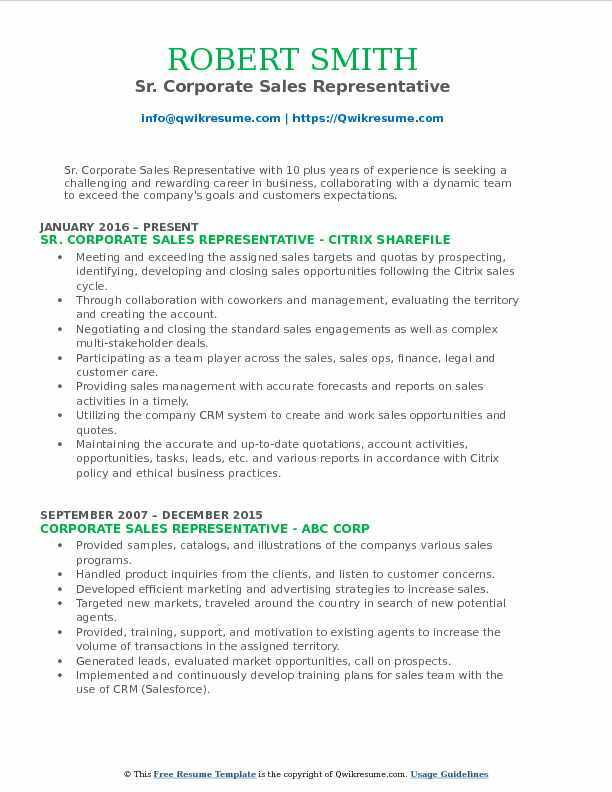 Objective : Corporate Sales Representative with one plus years of experience in Sales domain is seeking a position in sales or management where my skills, education, and experience will be an asset to the operation. Actively sought out new sales opportunities through cold calling, networking, and social media, prospecting and uncovering new opportunities within the community. Worked with customers to identify areas of underutilized benefits and finding how to apply the use of updates and feature releases in their current subscription to increase customer satisfaction. Worked with pre-sales technical resources to gain the complete understanding of customer needs and customize the appropriate solution through personalized presentations. Sold database performance and management solutions through the leadership development activities. Recognized customer business problems and align resources around those requirements. Generated marketing strategies and materials that differentiate from the market norm. Called back customers for various reasons of equipment, contracts, identification, etc. Developed program improvement that will enable representatives to actively resolve account issues in a timely manner.